Buying jewelry is the most enjoyable part in my shopping.I love to shop all kinds of Indian Jewelry.It doesn’t matter whether they are gold or fancy jewelry; they add more beauty and add elegance to our style.In our family, I am the youngest among all my cousins.Till my 20s I had never shopped for my own jewelry. All my sisters used to get different ornaments from their places .Those were the best memories in my life; In that process, i got used to wear all varieties of jewelry. Especially, bangles and bindis Even now, if I see a new variety in the market then I try to grab them. Recently, when I was trying a pair of earrings in a shop, one lady came to me and enquired about those earrings. “Where did you get them? I wanna try them too”. Yes, that always happens to every woman. When they are in our hands, they won’t appear nice; When you see others flaunting the same one, then it looks more beautiful.That’s the magic of jewelry. 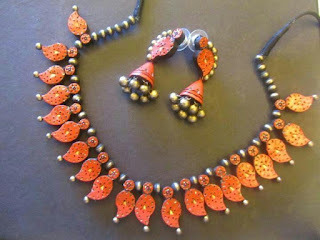 There are so many varieties of earrings in Indian traditional jewelry. Jhumkas (butta kammalu in telugu) are my all-time favorite earrings popular in India. 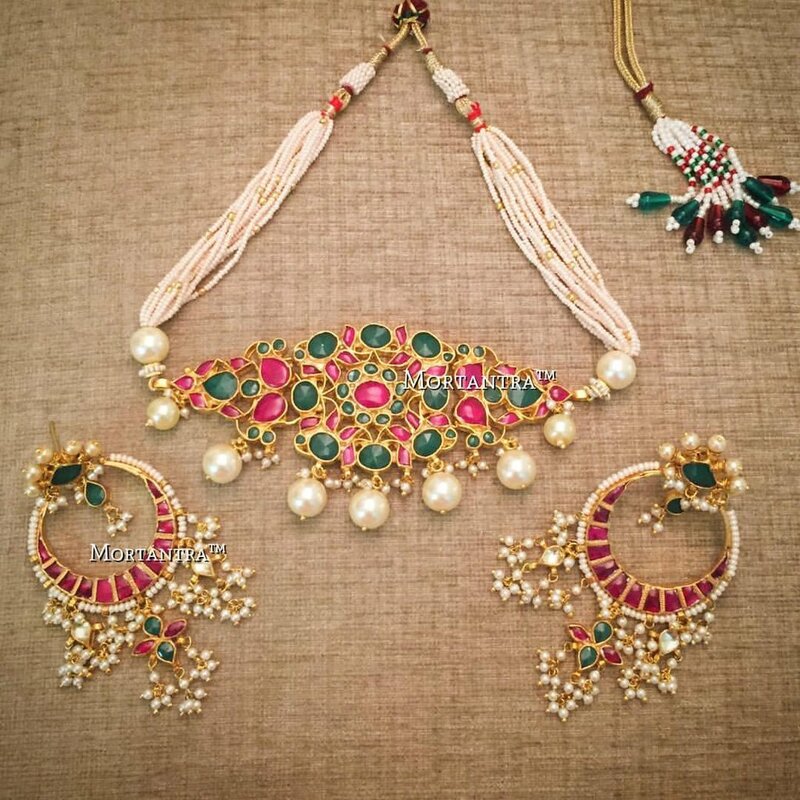 They come in different sizes, layers (two or three jhumkas one on top of another).In some areas they call it as Bridal jhumkas as they are extraordinarily desirable jewelry. Now a days, these jhumkas are coming in various metals with cz stones, rubys, emeralds and moti (pearl), kundans and polki.You can pair with silk sarees (traditional pattu sarees and heavy worked lehengas) for weddings, receptions etc. Black metal jhumkas with beads in different colors are suitable not only on traditional wear but also on modern skirts and tops. 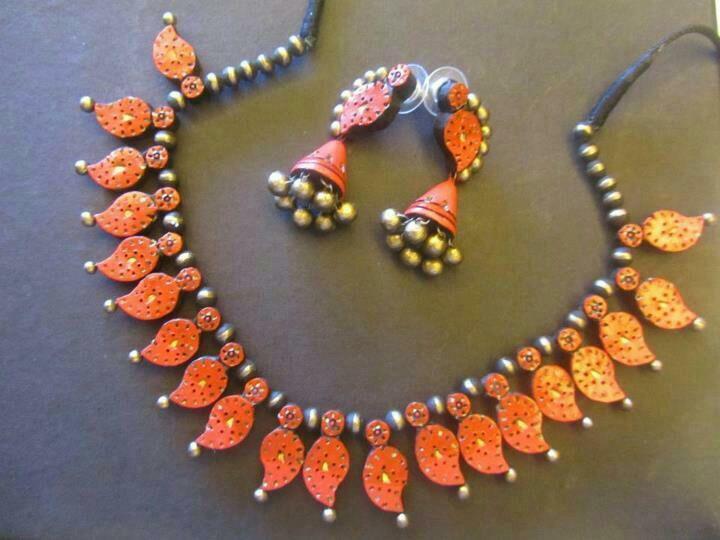 Kashmiri jhumkas are one of the varieties in Indian traditional jewelry. They go well with heavy worked georgette sarees; We should all try contrast colored kashmiri jhumkas. 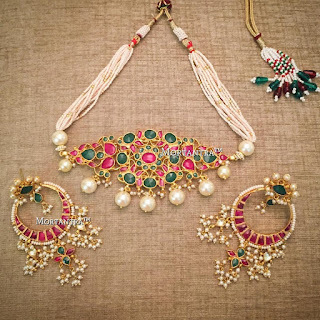 They are long hangings with small jhumkas.I found most of the kashmiri jhumkas are made with kundan and pearls. Antique Chand bali earrings are fashionable and evergreen. You can put on those earrings for any ocassion. In my college time, i used to put pearl danglers for every day; those are really cool on churidaras. Hoop earrings with jhumka are popular in these days. Alia Bhatt had these ear rings in ‘ Mei tanu samjhawon ki’ song I love to put those ear rings to temples and get togethers. 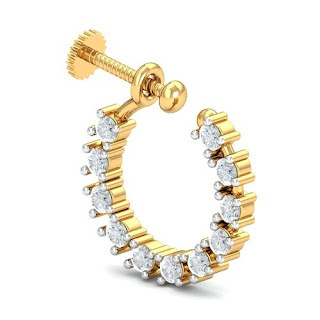 There are so many varieties of hoop ear rings in the market; plain ones, design, and small hoops with hangings in the centre are amazing for kids. Simple wear studs are comfortable and suitable to every one for the daily use. All ear rings are available in all metals like gold ,silver, brass ,copper and black metals too; especially earrings made of copper with stones and beads are spectacular. Small studs are really good for every day use to toddlers. Earrings with heavy flower design along with a beautiful pendant are perfect matching to lehengas. There are endless collection in multi colored hangings which are great on anarkalis and simple sarees. Nose rings mean a lot in Indian tradition.Piercing a ring on left side of the nose before wedding is honoring lord parvathi matha. According to ayurveda left side nose is affialted/associated with the women reproductive organ. Each state has its own style of nose ring varieties in India.Nose ring is an important accessory in bride’s costume.It enhances the beauty of the bride.Here are some old and modern nose rings. Stud or plain gold nose rings(small tiny nose rings): These are the small nose rings with variety of stones(red, orange, yellow, purple etc) some of them are with diamond.They do come in round and star shapes etc. Nath (big nose ring/hoop nose ring) is another variety of nose rings.These are admired in North India. I saw this Nath in my favorite cricketer M.S.Dhoni’s wedding pictures.His wife was looking graceful with Nath. Small curve/Lshape nose rings with pearls and red stones are fabulous for traditional occasions.In these days, even i find designed silver nose rings gaining popularity.